Kennards Hire has introduced a new compact, self-propelled man lift is ideal for work on low-load rated, suspended floors and other sensitive floor surfaces. The manlift has a gross weight of just 790kg and non-marking tyres and provides a maximum platform height of 3.66m (12ft), working height of up to 5.49m (18ft) and a safe working load of 227kg. With an efficient electric drive system and a long run time, the manlift provides greater productivity and reduced downtime during the recharge cycle. According to Neil Single, the new manlift takes the worry out of contractors doing overhead maintenance work. 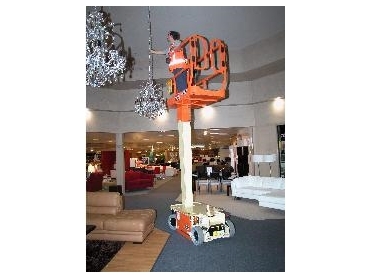 The self-propelled man lift is safe, causes minimal disruption and does not damage floating wood floors in display areas.